Winter walks. Stroll picturesque downtown Stevens Point. Check out the murals that adorn downtown and drop in on a restaurant or café to warm up with a tasty meal. Other great places to take a winter walk: wander the beautiful UW-Stevens Point campus or pay a visit to the Stevens Point Sculpture Park. Snowshoeing. Take a trek on the 1,000-mile Ice Age Trail. Part of this celebrated footpath travels through eastern Portage County and provides an unforgettable hiking experience. Skiing. Cross-country skiers can enjoy wonderful trails in Standing Rocks County Park in eastern Portage County and Iverson Park in Stevens Point. 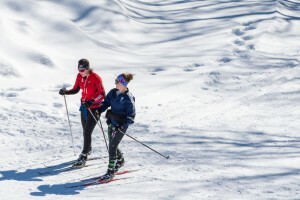 Downhill skiers: check out the action at Standing Rocks. Sledders will find great runs in Iverson Park. Snowmobiling. 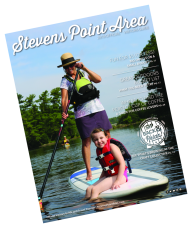 Discover more than 300 miles of trails in the Stevens Point area. Great hotels near the trails make this a fantastic base for your next snowmobile vacation. Need more help planning your winter getaway? Find us online or check us out on Facebook, Twitter and Pinterest. The Stevens Point Area Convention & Visitors Bureau has announced the winner of its recent Central Wisconsin Craft Collective Sweepstakes. Christina Gordon of Madison and three lucky friends will receive a grand-prize package that includes lodging at Hampton Inn Plover-Stevens Point; tours and tastings at Central Waters Brewing Company, Great Northern Distilling, O’so Brewing Company, Kozy Yak Brewery/Fresar Winery and Point Brewery; swag from all the Craft Collective members, and more!